The plug-ing creates two thumbnails for an image inside an article: the first is for inclusion inside the article and the second is for a category or section blog. This makes it possible to create a small thumbnail for a category blog, section blog and front page articles, and a midsize thumbnail for the article view. The plug-in also automatically creates a reference to a full-size image if the picture has the thumbnail inside the article. The plug-in can create a third large thumbnail to open as the fullsize image. Nice feature, if your users upload photos to site directly from the camera with a very large size. There is the possibility of automatically overlaying the watermark on the images of your site. A watermark (your logo, name or URL of your site, etc.) will protect your images from copying, making their copying meaningless. Crop or Fit image to thumbnail size. Auto ajust size of thumbnail, if you set only width or only height of thumbnail. Three ways to store thumbnails: in the same folder as original image; in cache folder; in subfolder 'smart_thumbs' of original folder. Three ways to open original image: popup window, Joomla SqweezBox, Highslide effect. Watermark image or/and watermark text for original image and for thumbnail. 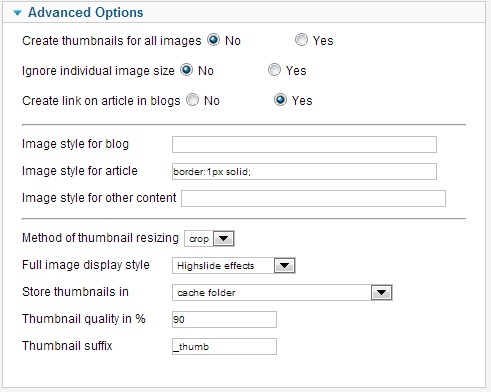 Thumbnail width for blogs - thumbnail width for pictures in a category blog, section blog and front page. 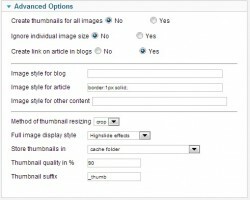 Thumbnail height for blogs - thumbnail height for pictures in a category blog, section blog and front page. Default thumbnail width for articles - default thumbnail width for pictures inside articles. Default thumbnail height for articles - default thumbnail height for pictures inside articles. Create large thumbnails - to create or not to create a thumbnail, which will open in a window instead of the original image. Nice feature, if your users upload photos to site directly from the camera with a very large size. Plug-in can create a thumbnail to open as the fullsize image. Tip: delete old thumbnails after changing thumbnail size in plugin parameters to prevent clogging of the site folders. Location of thumbnails depend on parameter "Store thumbnails in". Create thumbnails for all images - If No then create thumbnails for images with 'smartresize' class only, if Yes then create thumbnails for all images except images with 'nosmartresize' class. Ignore individual image size - If Yes then ignore individual image size in IMG tag and apply a default thumbnail size for articles and other components except images with 'smartresizeindividual' class. Create link to article in blogs - if Yes, then plugin creates a link to the article for the thumbnail. Image style for article - you can set thumbnail decoration in article with this parameter. Image style for other content - you can set thumbnail decoration in other component content (not com_content) with this parameter. Method of thumbnail resizing - if 'crop', then image will be cropped to thumbnail size. If 'fit', the image will be scaled to the size of the thumbnail, however, if the image proportions are not the same as those of the thumbnail, white margins will be left. Full image display style: Pop-up window - full image opens in a pop-up window. Joomla SqweezBox - full image opens in a standard Joomla mootools SqweezBox. Highslide - full image opens with highslide effect. Store thumbnail in - the same folder as original image, in cache folder or in subfolder 'smart_thumbs' of original image folder. Thumbnail suffix - sets a suffix for the file name of the thumbnail. Thumbnail quality in % - Sets the thumbnail image quality. Create image caption in articles - if yes, then creates caption above or under the thumbnail in articles. Caption is the text from 'alt' or 'title' tag of image. Create image caption in category blogs - if yes, then creates caption for thumbnail in the category blog layout or in the homepage layout. Create image caption in other content - if yes, then creates caption for thumbnail in other component content. Image caption position - under or above thumbnail. Parameters 1 and 2 set fixed size for the thumbnails to be displayed in category blog, section blog and in the front page. Parameters 3 and 4 set default thumbnail size for the article view. Each image can be assigned its own thumbnail size inside its article by defining properties 'height' and 'width' in IMG tag in the editor. If neither 'height' nor 'width' are given, the thumbnail size will be determined by default parameters 3 and 4. Tip: While inserting an oversized image into an article, adjust image properties to the necessary reduced size. This will make the image display appropriately in the editor as well as generate a thumbnail of a proper size. It is possible to set just the width or just the height for plug-in parameters or in image properties. In this case the missing image dimension will be automatically calculated based on the proportions of the original image. Should the proportions that you set differ from the proportions of the original image, the thumbnail will be cropped or fitted either horizontally or vertically. You can use plugin parameters "Image style for (blog, article, other content)" described above to set decoration for thumbnails. this is more easy way than declaring .smartresize class in template.css file. In order for the plug-in to create thumbnail for all pictures, set parameter Create thumbnails for all images to Yes. In this case you do not need to set smartresize class for each image. Also in this case You can use nosmartresize command in Class property of <img> tag to prevent creation thumbnail for the image. Caution! If this option is turned on, pages with large number of images may take longer to load the first time while the thumbnails are being generated. Subsequent loads will be faster. Tip: Do not use international symbols, spaces or special characters in file name of original image. Use only latin symbols and symbols '-', '_' to prevent errors while processing image by plugin. Watermark - "Nothing" - no watermark overlay; "Full size images only" - watermark overlay on full size images only; "Full size images and thumbnail" - watermark overlay on full size images and thumbnails. Enable for - "All images" - watermark overlay for all images processed by content plugins; "images with class 'watermark' only" - watermark overlay for images with 'watermark' class only. Watermark file - select watermark image file. Horiz. position - select horizontal position of watermark. Horiz. shift - horizontal indent of watermark from left/right. Leave empty for 'center'. Vert. position - select vertical position of watermark. Vertical indent - vertical indent of watermark from top/bottom. Leave empty for middle. Transparency - "Simple overlay" - watermark will be overlayed with 'transparency' setting. "Transparent background color" - watermark will be overlayed with 'transparency' setting and the background of watermark specified in "Transparent color" option will be transparent. Transparent color - Set the (background) color of watermark that should be transparent. For Transparent background color option only. Transparency in percent - specify the transparency of the watermark from 0 (completely transparent) to 100 (completely opaque). Watermark text - Specify the text to be overlayed as a watermark on the image. Font size for original image - specify the font size of watermark text for original image (in pixels). Font size for article - specify the font size of watermark text for thumbnails in article (in pixels). 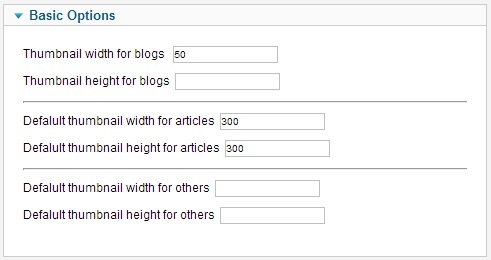 Font size for blog - specify the font size of watermark text for thumbnails in blog (in pixels). Text color - set the text color in hexadecimal format, for example #FFFFFF. Horiz. position - select horizontal position of text. Horiz. shift - horizontal indent of text from left/right. Leave empty for 'center'. Vert. position - select vertical position of text. Vertical indent - vertical indent of text from top/bottom. Leave empty for middle. Transparency in percent - specify the transparency of the text from 0 (completely transparent) to 100 (completely opaque).